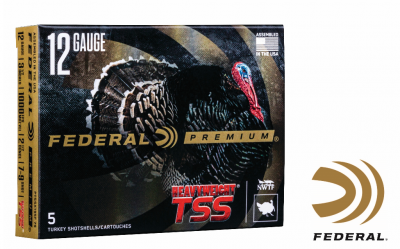 ANOKA, Minnesota – Federal, the only licensed ammunition partner of the National Wild Turkey Federation (NWTF), has expanded its HEAVYWEIGHT TSS lineup by adding loads with two sizes of shot to increase overall pellet count and number of hits on target. These new loads will be on display during the 2019 SHOT Show (Booth No. 14551), January 22-25 at the Sands Expo Center in Las Vegas, Nevada.